Never mind the horse racing. Or even dog racing for that matter. On March 26, Phoenix, Ariz. will play host to racing of a different breed – that of ostriches, camels and zebras. Yes, zebras. While it may sound like something straight out of a cartoon (or a movie – see below), it is, in fact, a real event. And yes, we think it’s a little weird too. The camels and ostriches have been a part of the alternative races for years and is not a new practice in other parts of the world. Australia and Africa is home to camel racing; ostrich racing is also big in Africa. 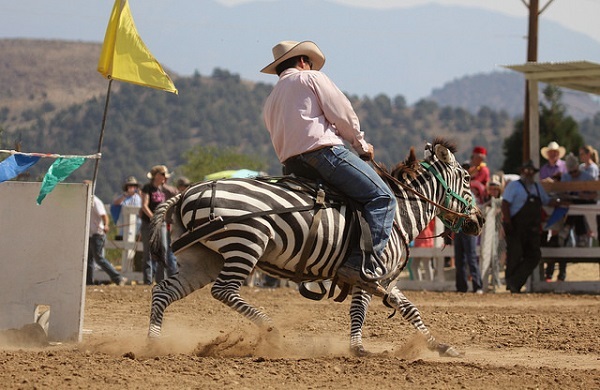 Zebra racing, on the other hand, may not be so popular here or elsewhere. This is the first year they will be a part of the Turf Paradise Alternative Racing Day event. Jockeys will ride the ostriches due to their light weight and exercise riders will ride the zebras. No betting is allowed for these races. For more details, visit the Turf Paradise website.